Forms is not dead. 15 years ago I heard that Oracle Forms has no future.15 years later, Oracle Forms 12c is here. If your strategy is to keep Forms in place for protecting your investments and you are convinced that Forms will continue to support your business, this article could be of interest for you. Do you have a digital transformation strategy while maintaining Oracle Forms at the heart of your information systems? For answering the question "How to modernize an Oracle Forms application for my business ?" we do have a lot of approaches and solutions. In this article I would like to share a "concept" for integrating Oracle Cloud Services within an Oracle Forms application. Oracle Cloud Services, however different by functionality and scope, share a common feature: accessibility via REST APIs. I would like to show how to integrate Oracle Document Cloud Service (DOCS) within my Oracle Forms application. For doing this, I use the REST APIs provided by DOCS. – It’s easy to learn. – Ajax: Every web developer knows and loves Ajax. Oracle JET makes use of some popular Open Source libraries. 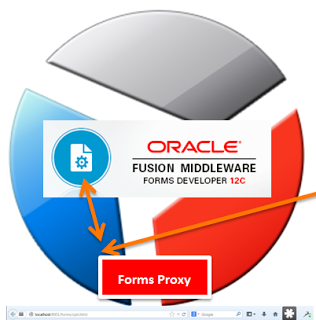 I have created the module "oracleforms" for managing the integration of Oracle Forms inside Oracle JET. Read the complete article here.